Acclaimed poet Seamus Heaney has died at the age of 74. Seamus Heaney was born near Toomebridge and as a child moved with his family to Bellaghy. His upbringing in the Co Derry countryside was to have a huge influence on his writing. He learned Irish and latin during his education at the Catholic boarding school St Columb’s College in Derry and Queen’s University in Belfast. While working as a young teacher in Belfast in the 1960s he began writing poetry and has since published an extensive volume of work. 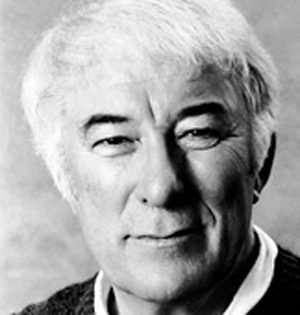 Heaney’s career led to him becoming a lecturer in Queen’s University but he resigned this role in 1972 to become a full-time poet. He lived in Co Wicklow but later moved to Dublin and became Head of the English Department at Carysford teacher training college. He then took up a position with Harvard that allowed him to teach for one semester and have the rest of the year free for his writing. He also delivered lectures in Poetry at Oxford University. He dedicated a lot of time to supporting emerging poets. While a lecturer at Queen’s University in Belfast he helped young poets to produce pamphlets of their work. Heaney also served as judge and lecturer in countless competitions in Ireland and abroad and was closely associated with the Field Day Theatre Company and the Yeats Summer School. In 1995 Seamus Heaney was honoured with the Nobel Prize in Literature. He has receieved many other honorary degrees and awards throughout his career. In 2011 he donated a huge collection of manuscripts and notebooks to the National Library of Ireland. He is survived by his wife Marie and their three children. This entry was posted in Uncategorized and tagged Belfast, Field Day Theatre Company, Heaney, Nobel Prize in Literature, poetry, Queen's University, Queen's University Belfast, Seamus Heaney, Siobhan McNamara. Bookmark the permalink.